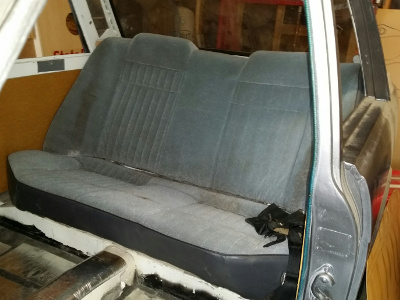 I've had several different seats in the car, none of which I've loved. This is probably because when it comes to the interior of my car, I'm cheap. 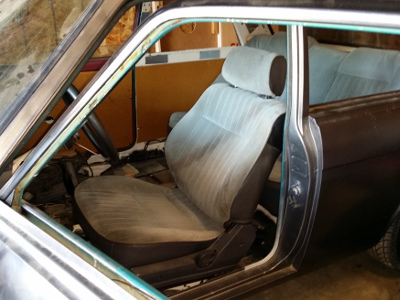 This latest version of seats came from a 1990 Nissan Sentra. The previous ones were from a Honda, and quite frankly, I wanted to keep all the parts in the "family," so to speak. Not too bad. A little dirty, but they fit the car pretty nicely. The front seat bracket was a bit of a pain, as they rails aren't level with one another. I had to use some square tubing to build up the rail so it would sit properly in the car.